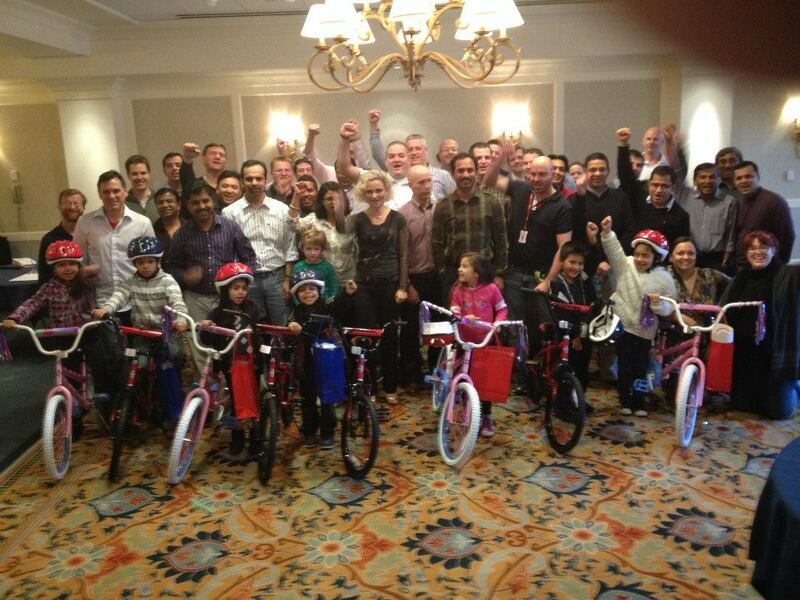 Fifty McAfee employees gathered in beautiful Monterey, California, just south of San Francisco, for Build-A-Bike ® team building event. The McAfee participants were from the Consumer Engineering group and came for a three day off-site planning meeting. The group was comprised of three different groups in this main session- engineering, product management and architects plus a couple of other strategic areas that work closely with them. The participants came from all over North America including Santa Clara, Beaverton, Ontaria and were mainly vice president’s, upper level management and leadership groups. They had a jam packed schedule and worked right up to the point of the team building event. We hopped right into it and the group was ready to have some fun and build some bikes! Planning meetings can be intense as there is a lot to be discussed and worked out. The Build a Bike event was a perfect way to see how and where the McAfee group could improve their sense of team and communication. Just like in a planning meeting their is no blue print to where you are going. There might be an outline as to what you want to accomplish but the plan has yet to be created. The Build a Bike event is structured the same way in that there is no road map given to the participants. The directions are kept vague so that the teams are forced to work together and figure out how to get their parts to build their bikes. The get a first hand view of how they communicate and partner to work through a problem. It is a fun way to see where and how their communication can improve to build a stronger team. The McAfee participants sailed through the exercise with flying colors. 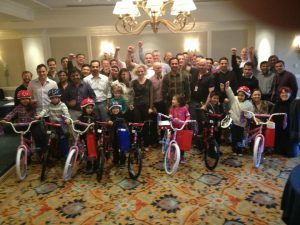 They built 8 new bikes that 8 children from the local Boys and Girls Club of Monterey Bay were very happy to receive. The children were kept a surprise from the participants and only as they ran into the room to receive their bikes did the teams know they would be there. There were many smiles as the children climbed onto their brand new bikes. It was a great end to a great day of planning for the future!